Recently, Lablogatory interviewed R. Marshall Austin, MD, PhD, in regards to the benefits of using both liquid-based cytology and HPV testing to screen for cervical cancer. The interview below has been lightly edited for brevity and clarity. Hi, Dr. Austin. Thanks for joining us today. Can you tells us a bit about your background? I consider myself a gynecological pathologist, which includes surgical pathology and cytology. I’ve been involved with cervical screening issues for quite some time. Going back to the 90s, and even before that with CLIA ’88. My PhD is in virology, which is relevant now with the all the HPV issues. I did my subspecialty training in GYN and breast pathology and cytology at the armed forces institute of pathology. Over your career you’ve authored or co-authored over 80 papers relating to cervical cancer screening. What made you so interested in this field of study? It was an area that became a hot topic with CLIA ’88. CLIA ’88 was precipitated by a Wall Street Journal expose on Pap smear screening in the United States, which was ironic because the Pap smear has been the most effective cancer screening test in the history of medicine. This drew me in, since it was my subspecialty area of interest. There had been technological advances in the field even though the Pap smear itself hadn’t changed that much since it was introduced during World War II. Computer-assisted screening, liquid-based cytology, HPV testing all really have dramatically changed the field. What was your initial reaction when the US preventative services task force released their draft document on cervical cancer screening recommendation in September of 2017? I thought it was a mistake. I wrote a letter why I thought so, and apparently a lot of other people did, too. How integral was the pathology and medical community’s reaction to this draft document in changing the USPSTF’s recommendations to include co-testing? I’m sure that the feedback had a cumulative impact. I’ve heard different views on what components were most instrumental. What made you decide to perform the recent study that appears in AJCP? I had read online at the end of last year a pre-publication paper published by the Journal of the National Cancer Institute. I had seen their figures presented by Walter Kinney as early as October at a meeting in Amsterdam. I asked him where these figures available, and he said they were going to be published. I thought their results were probably different than what we would have seen in our own lab. So I thought we really need to look at our own data in the exact same format as the data presented in the JNCI. We were able to do that by about March. Wow! That seems really fast, considering how large your data set is. We have kind of an unusual set up here because I work with two information scientists here at the University of Pittsburg. We automatically have all of our data being taken from our LIS into a cervical screening model which we call the Pittsburgh Cervical Cancer Screening Model and we have over 13 years of data. So we’re in kind of a unique position to very quickly put our data into different types of formats. Agnieszka Onisko, the information scientist on the publication, was able to quickly look at our data and get it into the same format as the paper from Kaiser. Once I saw how different our results actually were, my goal was to get the paper out before the USPSTF report came out. We had our tables and figures by March and I submitted the manuscript to AJCP in early May. Let’s talk a little bit about the benefits of cotesting, and some of the downsides. Well, the reason I always tell people, the reason that women get screened is because they don’t want to get cancer and they don’t want to die of cancer. Getting screened isn’t a pleasant experience, necessarily, but women don’t get screened because they’re worried about dysplasia or some other condition. They’re worried about cancer. The other thing that’s always been misunderstood is the limitations of screening. Screening was effectively sold to the American public by the American Cancer Society and the National Cancer Institute, and while it was an effective campaign, it basically left women with the impression that if they get screened, they won’t get cancer. Although cervical cancer screening has been the most effective cancer screening program ever, it’s never been perfect. A paper out of England in 2016 had a sophisticated analysis about the effects of cytology screening on cancer rates in England. It estimated that about 70% of cancer mortality was being eliminated with screening, and could potentially be as high as 83%, which still isn’t 100%. So when women get cancer, they get upset. My general philosophy has always been that we should do as much as we can to minimize cancer in the screened population because that’s what the public wants and expects. The disadvantages of cotesting is one, it adds costs. Two tests cost more than one, after all. And also, cotesting adds the potential for more red flags that require potential investigation that can increase the number of procedures. Having said that, and having been involved in a number of years especially in cases where litigation is involved the public wants and expects the most protection possible. So, to me, the extra cost is still in line with what the public wants: the maximal possible protection. Up to Date or Up for Debate? Hello again everyone! Welcome back. Now, you may or may not have heard in recent news that the United States Preventive Services Task Force (USPSTF) updated their long-standing guidelines for screening women for cervical cancer. Normally I wouldn’t file this away under “exciting must-read,” but I was piqued when I also read that ASCP along with the College of American Pathology (CAP), American Society of Cytopathology (ASC), American Society for Colposcopy and Cervical Pathology (ASCCP), the Society of Gynecologic Oncology, the American College of Physicians (ACP), the American Society for Cytotechnology (ASCT), the American Cancer Society (ACS) the Papanicolaou Society of Cytopathology, as well as the American College of Gynecologists (ACOG) and other professional institutions and individuals voiced concerns over the changes to the USPSTF standard. This is a topic that can be discussed for days, but I’ll do my best to give you the readers’ digest and present the main contentions regarding this standard of patient care and laboratory methodology. Slow down. Explain co-testing and primary testing? What exactly do the old and new recommendations mean? Okay. When women undergo routine cervical cancer screening they receive Pap smears (cytologic examinations) every three years. This testing has been the standard for a number of years and is adequately sensitive for women up to the age of 30. Often times, these younger women may have slight intraepithelial changes (LGIL) which are considered low grade and remiss on their own. After that age it has become standard practice to add the additional test (while collecting the Pap specimen) of HPV DNA testing. This adds an increased level of sensitivity/specificity and is called co-testing. The new recommendations depart from this co-testing model, citing that there are increased harms (in the form of false positives) which ultimately lead to waste and unnecessary testing for women after the age of 30. Primary testing would mean only screening with HPV DNA assays after 30. According to the National Cancer Institute, all available literature on the subject of HPV and cervical cancer testing adequately demonstrates that co-testing is the best option. A number of studies were compiled to address the harm vs. benefit of Pap and HPV testing. Together, however, these tests decrease the incidence of cervical cancer. New guidelines were made based off mathematical projections and cost-benefit analyses which try and minimize losses for screening. Dr. J. Kim, a public health researcher at Harvard, was integral in contributing models which projected the cost/benefit of changing HPV guidelines. Essentially, the study projected that, when considering “harm” (i.e. colposcopy/false negative) abandoning co-testing changed the mortality rate from 0.3-0.76 per 1000 women with co-testing, to 0.23-0.29 per 1000 women with primary HPV testing. An impressive and significant statistical advantage. However, the total number of unscreened women with mortality rates was between 1-2%. This study was a microsimulation done from historical data within rates of cytologic detection and retrospective testing data on women, projected for a future hypothetical 5 year interval. Fascinated by this study, I tried to reach out to Dr. Kim to discuss limitations in using models and simulations and public health evidence to change practices, but I’m sure she is busy and could not respond in time. So, to co-test or not to co-test, that’s the question. Right? So, what’s the current technological climate for how we test for HPV? As of now FDA approval for HPV primary testing for high-risk strains is limited to the Roche Cobas hrHPV test. I could link you to their website, but you’ll be sold right away. They tout the future of HPV screening is HPV primary testing and to do away with the Pap! Their graphs and figures are impressive (just like their price tag!) and there’s no doubt that sensitivity is something that real-time PCR provides more than cytologic examination. But, as always, more assays will be approved, and advancements will tweak the sensitivity and specificity higher and higher. Got it. So, technology and lab tests are always advancing, why can’t we make this change? It’s not so easy to change the method or assay we use to screen or diagnose patients in the lab. If you recall, I talked about how the hospital I’m currently rotating in is leading the region in advancing the new high-sensitivity troponin assays. It’s still a hard sell to many even though the data and projections seem to all point to a green light. But that’s a paradigm shift that involves side-stepping from one immunochemical assay to a more sensitive immunochemical assay. It’s the same stuff, just sharper and with more clinical data to interpret with regards to acute coronary symptoms and clinical risk stratification. Swapping an old car for a new car. This conversation is a bit more complex. The recommendations for cervical cancer screening suggest that we should move away from mostly morphologically-driven, human-based cytology interpretation and move toward PCR-based assays for detection. Literally apples to oranges. We might think we know which one is better right now, but longitudinal studies are the only way to really tease out if this change in practice to improve patient outcomes in the long run. Ultimately, I think a few things need to happen for this recommendation to become standard practice. First, professional societies in every discipline from gynecology to cytology need to come to an agreement. It remains to be seen whether certain agencies will adopt and recommend the USPSTF guidelines, and statements from groups like CETC reveal a vote of no confidence in this current climate. Ultimately, because of numerous objections (including the ones from ASCP and the CETC) the USPSTF does say that co-testing is still optional between patient and provider, so we’re not really in crisis mode. But what happens when the advancements and the recommendations catch up to our ability to abandon the cytologic contributions of a future useless Dr. Papanicolou? We could probably deal with that when it comes to fruition, but until then we have a real discussion about what “harm” really is. Is colposcopy flat out harm? Or are the false positives that reflex to further testing? Is the current practice a safety-net for populations across socio-economic tiers with varying access to screening in the United States? When compared to other countries, HPV prevention, vaccination, and screening is much more easily facilitated. Is this a contributing factor for our messy guidelines? Will there be more options for FDA approved methodology in the near future? There remain a number of good questions which require examining cross-sections of data and patient outcomes. And, I believe, we may see change soon—but not quite yet. What are your thoughts? What have you experienced in your lab or clinic? Leave your comments below! Author LablogatoryPosted on October 1, 2018 Categories cytology, generalist, pathologyTags cytology, generalist, HPV, pathologyLeave a comment on Up to Date or Up for Debate? The American Society of Cytopathology is conducting a reproducibility study, and they need your help. They’d like for participants to evaluate images from the new Paris System for Reporting Urinary Cytology Atlas. If you’re able to participate, follow this link. 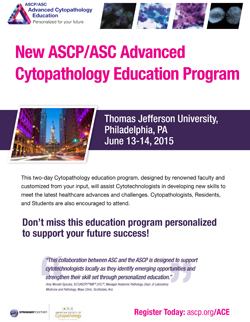 ASCP and ASC have put together a program to enable cytotechnologists to grow their skills and advance their careers. During this workshop, attendees will learn how to engage as a part of the clinical team and broaden their skill set to include fluorescent in-situ hybridization and interpretation of applied molecular tests. If you’d like to attend this program, you can register before April 30 to get a discount.